Every so often, I have the pleasure of working with one of our organizations on a very special event or project. In this blog, I will share an example of how NFI has partnered with a faith-based organization on an annual basis to help them make a difference in relationships between families and children that have an incarcerated parent using customized NFI resources. The organization I am speaking of is Prison Fellowship®. Each year, I have the pleasure of working with Prison Fellowship staff on the Angel Tree® Program. Karen Beuford, who is the project manager and my contact for Prison Fellowship’s Angel Tree program says that “the program is nationwide and reaches out to approximately 2.7 million children with parents that are incarcerated”. Originally, when I began working with Prison Fellowship on this project, NFI furnished 2 different customized brochures featuring both the NFI logo and the Angel Tree Project logo at around 23,000 in quantity. We furnished one in English and one in Spanish for each. I am happy to report that over the past 4+ years, I have watched it grow substantially! We now furnish Prison Fellowship with 8 brochures – 4 in English and 4 in Spanish – totaling over 150,000 in quantity. 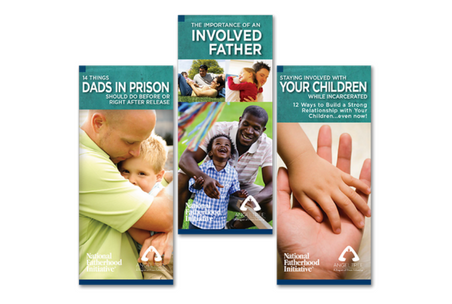 These brochures provide tips for incarcerated dads on parenting, increasing their involvement with their children, how to manage money, and how to prepare for release. Here is a little bit of background as to how Angel Tree began. Back in 1982, Prison Fellowship’s Angel Tree Program was started by Mary Kay Beard. Prior to 1982, Beard was incarcerated herself. While incarcerated she saw the urgent need for parents to connect with their children. After being released, she became the first director in Alabama for the new Prison Fellowship Angel Tree Program. Each year the Prison Fellowship staff reaches out to Prison Chaplains to let them know about the Angel Tree project and asks if they would be interested in participating. The facilities that wish to participate receive resources which include the customized NFI Brochures. The Chaplains then use these brochures either by distributing them to prisoners individually, or as a counseling tool one-on-one with the prisoners. To learn more about this life-changing program or to participate, be sure to visit Prison Fellowship’s Angel Tree Program webpage. Did you know that NFI can customize NFI resources by adding your organization logo? If you have an annual project or event coming soon, I would welcome the opportunity to work with you to help make it a success! If you have any questions, you can reach me direct at 240-912-1263. This is a great way for NFI to partner with you to increase father involvement in our nation’s families!